James Arthur O'Connor (1792-1841). O'Connor was the son of William O'Connor, an engraver and print-seller who carried on business at No. 9 Exchequer Street, and, from 1791, at No. 15 Aston's Quay, Dublin. James O'Connor, beyond some lessons he is said to have received from William Sadler (q.v. ), was self-taught as an artist. His early works were compositions; his first studies from nature were made in the Dargle where he delighted in portraying its rocks and tangled foliage and rushing waters. In 1809 he commenced to exhibit, sending from 13 Aston's Quay an oil sketch, "Card-players," to the exhibition held in the Dublin Society's House in Hawkins Street. He continued to exhibit there until 1821, with the exception of the years 1816 and 1817, his contributions being mostly landscape compositions. In 1810 he published three etchings of figures, which were described in the "Hibernian Magazine" "as the first productions of a young and, as we have some reason to believe, a self-taught artist." He had formed a friendship with George Petrie and Francis Danby, to the latter of whom he had given some instruction in painting, and the three young artists determined to pay a visit to London. They arrived there in June, 1813; but their want of means made their stay a short one. Petrie returned to Ireland, and O'Connor and Danby set out on foot for Bristol where they arrived penniless. By the sale of some drawings Danby enabled O'Connor to return to Dublin; he himself remaining. On his return, O'Connor settled down as a landscape painter at 15 Aston's Quay, Dublin and later, in 1819, at No. 18 Dawson Street, Dublin. He painted the scenery of Wicklow and the neighbourhood of Dublin, and in 1818 and 1819 was in the west of Ireland where he was patronized by Lord Sligo and Lord Clanricarde, for both of whom he painted a number of pictures of local scenery, views about Westport and Portumna. In 1820 he was awarded a premium of 25 guineas by the R.I. Institute. Though he worked hard he found but little demand for his pictures in Dublin; he had married, and, anxious to improve his prospects, he left Ireland and went to London. He began to exhibit at the Royal Academy the year of his arrival, 1822, and found some sale for his works. He continued as a constant exhibitor both at the Academy and at the British Institution until 1840, and also at the Society of British Artists, of which he was a member. He contributed to the Royal Hibernian Academy only twice, in 1836 and 1840; but a number of his works were exhibited there in 1842 and 1843, after his death. In 1826 he went to Brussels where he remained a year, and was successful in disposing of many of his pictures. In 1832 he was in Paris where he stayed eight months, leaving in May, 1833, when, accompanied by his wife, he visited Chalons, Saarbruck, Saarlouis and Metlach, and thence to Treves and down the Moselle to Coblentz and on to Mayence and Frankfort, returning to London in November, 1833. During this tour he painted some of his best pictures. In London he laboured incessantly, but with small success. He suffered from weak sight, and in 1839 his health began to fail. His inability to work involved him in pecuniary embarrassments, and, after a life of struggle and disappointment, he died in humble lodgings at No. 6 Marlborough Street, College Street, Brompton, on 7th January, 1841. He left a widow unprovided for. A subscription, headed with twenty guineas from the Prince Consort, was started for her benefit in 1845. O'Connor was a painter of deep feeling; his landscapes are solidly and vividly executed and are good in tone and colour. He was happy in the delineation of wild scenery and richly wooded landscapes, often with early morning or moonlight effects, in which he excelled. 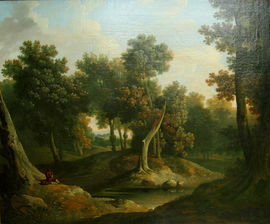 He was fond of introducing small figures in red coats or dresses into his landscapes. Most of his work was in oil, but he occasionally worked in water-colour. His works are housed in many National Collections.